Here I consider the two largest oil plays in the U.S.: the Eagle Ford and Bakken shales. Eagle Ford is also a significant gas and condensate producer. At their respective production peaks, these two shales together produced about 3 million barrels of oil per day and destabilized global oil markets on the expectation that both would continue to produce at this high level for several years. As I show below, oil production from the Eagle Ford and Bakken might have already peaked, and their ultimate production might be 8 billion barrels of oil and 23 Tcf of natural gas. Both may eliminate 3 years of oil imports into America and satisfy 10 months of natural gas consumption. While these volumes are quite significant, they are a far cry from the 15 billion barrels of proven recoverable oil reserves "predicted" by the industry experts for the Bakken shale alone. 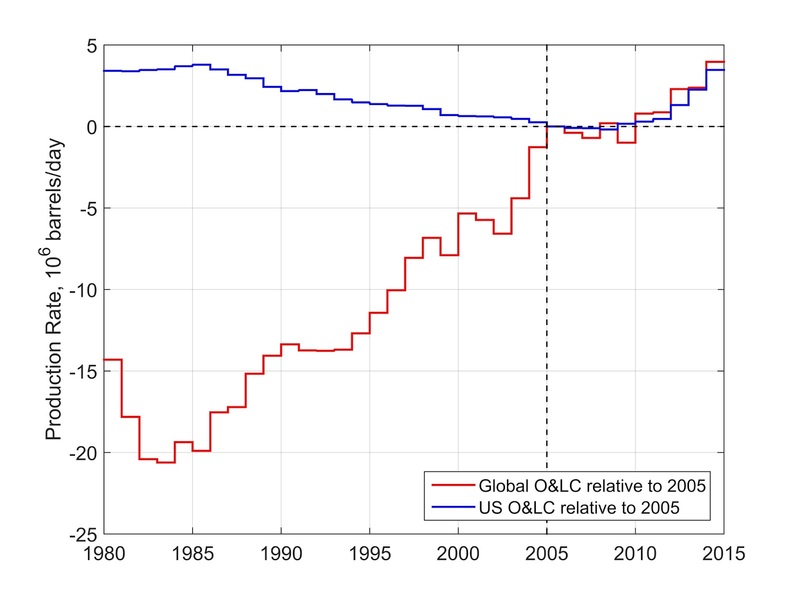 The plot below shows global production of crude oil and lease condensate in the world in red and the U.S.A. in blue, both relative to the production at the end of 2004. Notice that between 1982 and 2005, global production of crude oil increased by 20 million barrels of oil per day (20 MBOPD). During the same time period, the U.S. crude oil production decreased by about 4 million barrels of oil per day (4 MOPD). Therefore, the new field projects outside of the U.S. generated an incremental 24 MOPD. 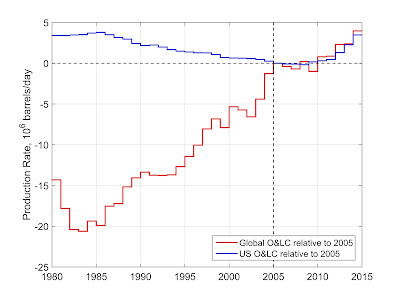 The rate of crude oil and lease condensate production in the world's and U.S.a in millions of barrels per day. Both curves were shifted by subtracting the respective production rates in December 31, 2004, so that the zero level of production corresponds to to this date. Since 2005, the increase of global production has been numerically equal to the increase of U.S. oil production, which in turn has been dominated by oil production from the Eagle Ford and Bakken. This means that the output of all petroleum projects outside of U.S. has stagnated; production growth in some projects has been exactly cancelled by declines of other projects. In other words, we are near the peak of crude oil and lease condensate production in the world. And this 10-year stagnation of global production happened despite the record investment in upstream E&P of up to $700 billion per year before the last oil price collapse. If net increase of global petroleum production is almost equal to U.S. shale oil production, it follows that sales of the Eagle Ford and Bakken crudes controlled to a large extent the global petroleum markets. Expecting that U.S. oil production would continue increasing, Saudi Arabia refused to cut its production and price of oil collapsed around the world. It is therefore important to estimate ultimate oil and gas production in both Eagle Ford and Bakken, and possible production declines in both of these plays. Such an analysis has strong geopolitical implications and here I will tread lightly. Let me start from showing you the overall energy production from both plays in EJ/year and EJ. 1 EJ = 0.81 trillion standard cubic feet (Tcf) of natural gas or 163 million barrels of (equivalent) oil. In 2015, U.S. produced 3.44 billion barrels of oil and imported 2.68 billion barrels. The U.S. also consumed 27.4 Tcf on natural gas. Supposing that ultimate total production from the Eagle Ford will be 50% higher than the ultimates reported in the two charts below, 2.7*1.5 = 4 billion barrels of oil and 12 Tcf*1.5 = 18 Tcf will be produced. Therefore, in total, the Eagle Ford shale might eliminate 1.5 years of U.S. crude oil imports, and satisfy 8 months of consumption of natural gas. Please click on the image to see it in full resolution. Rate of total production of oil and gas in the Eagle Ford formation. In EJ/year. The 6 EJ/year at the peak of production is equivalent to 1.6 MBOPD and 6 billion standard cubic feet of gas per day. Cumulative total (oil+gas) production from the Eagle Ford shale. The ultimate 29 EJ produced is equivalent to 4.7 billion barrels of oil equivalent or 2.7 billion barrels of oil and 12 Tcf of natural gas. Also supposing that ultimate total production from the Bakken will be 50% higher than the ultimates reported in the two charts below, 2.6*1.5 = 3.9 billion barrels of oil and 3.3 Tcf*1.5 = 5 Tcf will be produced. Therefore, in total, the Bakken shale might eliminate 1.5 years of U.S. crude oil imports, and satisfy 2 months of consumption of natural gas. Cumulative total (oil+gas) production from the Bakken shale. The ultimate 21 EJ produced is equivalent to 3.4 billion barrels of oil equivalent or 2.6 billion barrels of oil and 3.3 Tcf of natural gas. An old Jew in Galicia once made an observation: "When someone is honestly 55% right, that's very good and there's no use wrangling. And if someone is 60% right, it's wonderful, it's great luck, and let them thank God. But what's to be said about 75% right? Wise people say this is suspicious. Well, and what about 100% right? Whoever says he's 100% right is a fanatic, a thug, and the worst kind of rascal." Call me a 60%-right kind of a guy. The number of Americans, who believe that there may be a critical shortage of energy supply in the next 5 years is at an all time low. Interesting thoughts Tad, thanks for sharing. Presenting the parameters of the curves you used might help readers less familiar with the Hubbert model. I guess the question now is where else can the "shale" blip be reproduced. 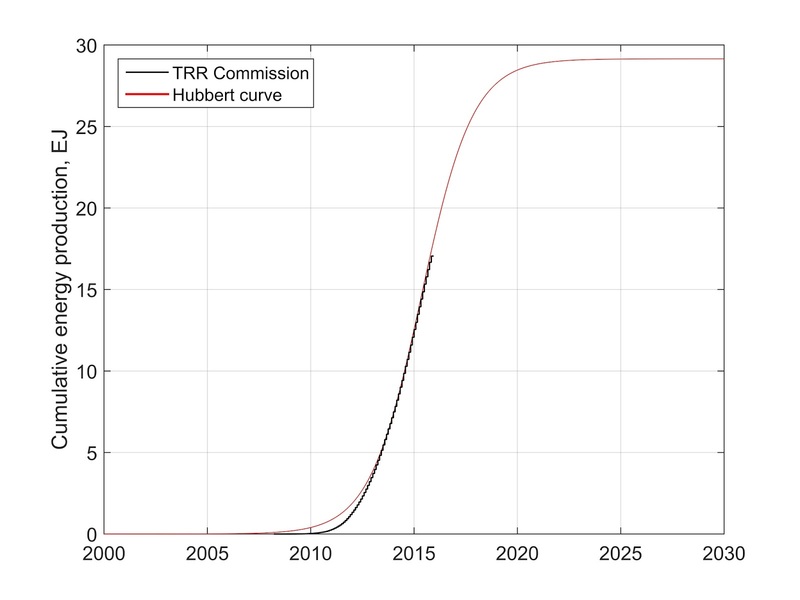 The Hubbert curve parameters will be published soon enough in a peer reviewed paper. What you see is all new work, hot from the press. I wanted to communicate my findings ASAP, because they are too important to sit on them for another year or so. As to the second question, I simply do not know. There is shale gas production in Argentina and new shale gas production will be tried in Saudi Arabia in two different locations. Regardless, a low quality reservoir made of mudrock is just that: a poor production target. 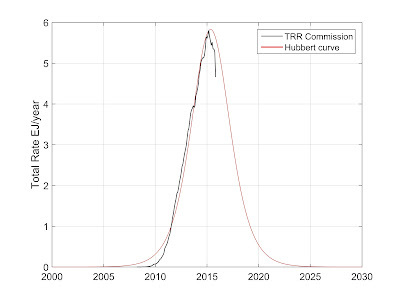 One must be very careful about a large scale development in shale formations and certainly one cannot repeat the much too optimistic well production curves and project economics all too common in the past in the U.S. The Bakken and EF turned because of price, not because of resource depletion. They were keeping up with depletion fine before the price crashed. 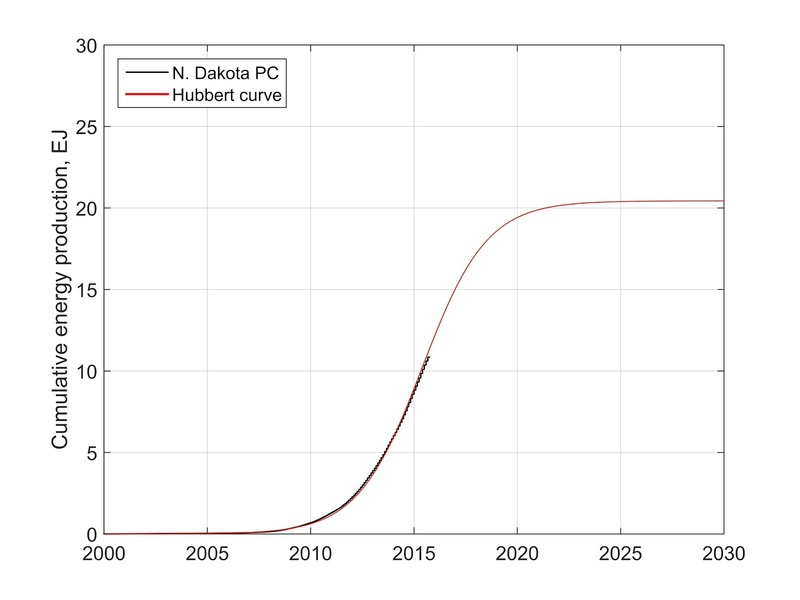 I have taken into account future growth of production in the Bakken and Eagle Ford shales by assuming that cumulatively they will each produce 2 times*1.5 = 3 times as much as their cumulative production to date. That's a lot more oil to be produced, but it does not change my fundamental argument that shales remain very poor reservoirs no matter what expensive new technology we throw at them. I am a reservoir engineer with 30 years of experience and I do not say this lightly. it doesn't matter what you say. The only real threat to the world is capitalism and consumism, it's the globalization. There is one market, the planet, and corporation willing to exploit every single resource to profit. They have the single most powerful weapon of the human history: debt. USA's oil shale system is totally screwed but fund itself by debt. So first of all USA must collapse as soon as possible, followed by other nations drived by consumism-capitalism. Then the world could start a new era. USA will try to start wars, and we should isolate from them. Unfortunately, europe has US slaves inside. Every macro region should be isolated, and communicate/trade only by rigid law. Otherways we are doom to poverty, more than today. 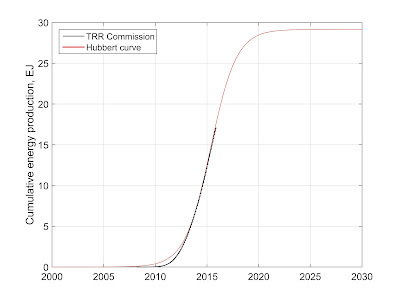 I don't think using a Hubbert curve at this stage of production is likely to give reliable results. The proved reserves in the North Dakota Bakken/Three Forks at the end of 2014 were about 5.5 Gb, 2P reserves would be about 50% higher so 8.25 Gb and cumulative production at the end of 2014 was 1.2 Gb. So we have a total of 9.45 Gb if there is no reserve growth or discoveries after 2014, an unrealistic assumption at best. 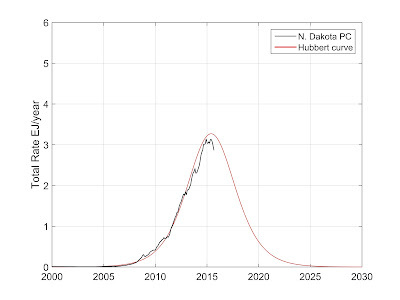 The 2015 peak in North Dakota Bakken/Three Forks was due to low oil prices, not due to a Hubbert peak. There are an infinite number of different logistic curves that could be fit to that cumulative data, including an ultimate of 11 Gb matching the USGS mean estimate in their April 2013 assessment. For the Eagle Ford 2P reserves at the end of 2014 were 5.5 Gb and 0.5 Gb of cumulative output for 6 Gb, I expect at least 8 Gb of C+C output from the Eagle Ford, similar to David Hughes estimate. What are your thoughts on the inclusion of lease condensate as crude oil? I have read that Eagle Ford super light oil production consists of up to 40% condensate (API 45+) and accounts for a large amount of US shale production increase. I'm sure there is a large surplus of actual crude oil but what effect do you think lease condensate has on these actual numbers? Yes, the two predictions are identical. Mr. Patterson beat me to it for the Bakken, but there isn't much to be happy about.